Just stopping by all quick like to let you know, there's new, easy way to subscribe to the Hook Me Up! 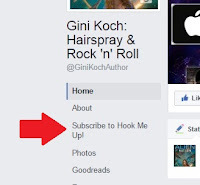 Newsletter on the Gini Koch: Hairspray & Rock and Roll Facebook fan page. If you take a look-see at the side menu, you'll now find a lovely Subscribe to Hook Me Up! option. You know you want to get all the latest news and be ready for the return of the contests! Click the link, give Gini your email and enjoy Hook Me Up! for news and exclusives from the Giniverse. iBook Sci-fi Romance Sale Starts Today! iBooks readers! 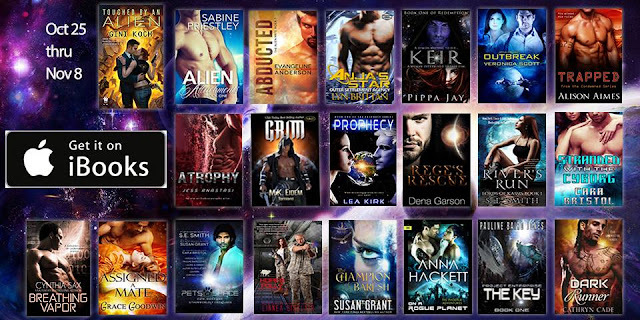 Starting October 25 (TODAY) through November 8, beef up your iPad, or iPhone library with great sci-fi romance e-books on sale now, courtesy of the Science Fiction Romance Brigade! Your girl Gini's Alien series book one - Touched By an Alien - is part of the sale, and you can pick it up right now for $1.99. At that price, tell your fellow iBooks readers you know will love it! Your electronics will thank you. 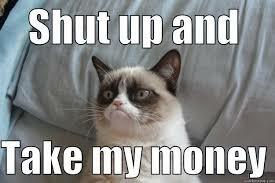 I'm sure many of you've noticed the increased publicity blitz in anticipation of book releases on the interwebs. You've also probably noticed these book campaigns kicking off earlier and earlier. Why you ask? -- fine, so you didn't but I'm gonna throw some knowledge at you anyway. Publishers, retailers, vendors, media sources - heck even other readers - not only want to know who's waiting with baited breath (alright that's probably an exaggeration) to get their hands on an author's next book but who's ready to put their money down right then, and there. I get a book release date notification. The push is to coax readers to pre-order new books as soon (and as much) as possible. They know authors (hopefully) have faithful followers and they know these fans are a book-buying mad bunch of bibliophiles. Pre-orders are the great predictor, the magic eight ball, the magic mirror on the wall if you will - and their importance is greatly increased in the publishing world. As a writer Gini's gotta bring the words and the worldbuilding; as author with publishing deals, Gini needs to bring in the book pre-orders, too. We want Gini's publisher to know we're excited about the next book so they keep the Gini writing giving us new books. Pre-order sales, along with the books sold at first release, count towards the first week sales numbers. Maximizing initial sales establishes bestseller contenders (wouldn't it be great to push Gini up on the lists?) and can impact the fate of future books. Gini releases two books in the Alien series a year - that means the pre-order cycle can be fast and furious. 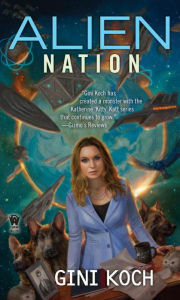 So let's help her by getting those Alien Nation pre-orders in and to wave that banner to her publisher that the book's on our radar. We want the Giniverse to keep the lights on. I don't know about you, but October equals watching Hocus Pocus and finding ways to work "dead man's toes" into conversation. It's a moral imperative because HALLOWEEN!! annnny-hooo ...as the leaves continue to turn and the moon does its waxing and waning thing, Gini heads out to spend this weekend in Richmond, Virginia. If you've ever wanted to get writing advice from Gini - she's part of the Faculty for the 14th Annual James River Writers Conference - so here's your shot. Going to be in the Richmond area or up for a weekend visit? Check out the learning opportunities and sign up to a class or two! Gini's set up a signing on Sunday, October 16th at 3:00 pm ET at Fountain Bookstore in Richmond Virginia. This signing is open to the public so bring your friends, come make new friends, and see your author-friend! Ask some questions, get your copy of the latest from Alien series: Camp Alien -- or any over her titles -- signed and chat. There's a Food With Fans event immediately after, so bring your appetite and plan to have a meal with your girl Gini! Gini's bringing bookplates to personalize. This post a drive-by to let you know Gini is on the move!